After traveling almost 8,000 miles in the back of our truck, Eleanor has the bed, dresser, and mirror her mommy used as a little girl and through high school. Debbie and I loaded this in the back seat and in the bed of our truck before we flew to Alaska May 19 this year. We returned from Ak June 5 and on June 6 started our trip west. Today we cut a piece of plywood for a bucky, assembled her bed, and made it beside her “new” dresser. Ellie might grow to love the furniture, but we are instantly gratified and thrilled to present it. Whatever can we do with all the space in the truck? We also ventured to Vancouver’s Chinatown this afternoon. Debbie and I had depleted our stash of Sencha green tea and found a good deal on large cans. We bought a large can from Ten Ren Tea & Ginseng Company on Main St. We’ll enjoy a cup or two this evening, and decide if we should buy more while we’re here. We also visited Marilyn’s Bakery and Restaurant and shared with each other bites of a curry beef pastry, egg custard, coconut custard, coconut cream pastry, bbq beef roll, and a coconut cookie. The snack gave us lots of zoom to explore another hour. 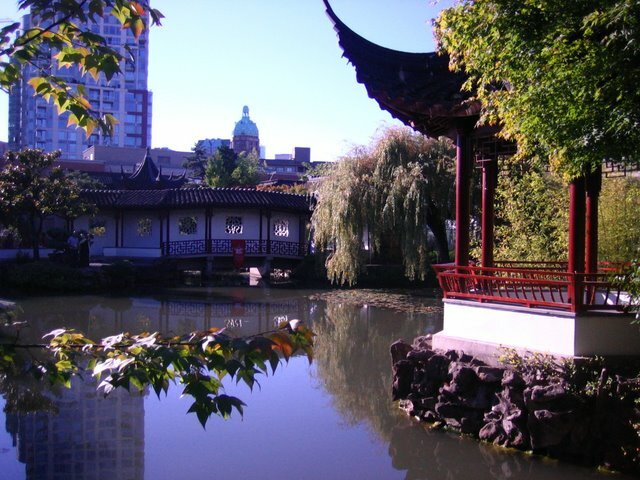 We walked through the public part of Dr. Sun Yat Sen’s Classical Chinese Garden. We’ll return with a much better understanding of the Garden’s meaning and purpose after reading about it this evening. Many of you may already know this isn’t Dr. Sun Yat Sen’s former home and garden. Instead the garden honors China’s first president and opened for Expo ’86.